Appy Couple is the most beautiful and creative way to share your wedding with a complete digital suite (app, website, emails) all in the designer look you choose. 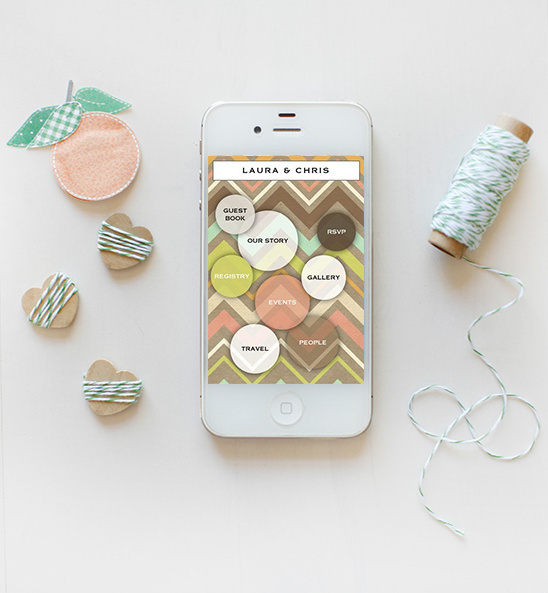 Appy Couple blends design and technology in one intuitive package. With Appy Couple you can not only make sure guests have every detail about each of your events, but you can also manage your guest list and RSVPs, send coordinating emails, and have guests take photos with the camera on the app. Appy Couple makes it easy for everyone to have a stress-free wedding. View all of their designs and options here and don't forget to take a peek at their Wedding Chicks vendor page. Join us again tomorrow for another Wedding Chicks vendor happy hour. To get information on becoming part of The Wedding Chicks, and join all the fun, email us by clicking here.